All photographs on this website were shot for the exclusive use of the City of Gonzales California Chamber of Commerce. No other use is authorized without written permission from the city. 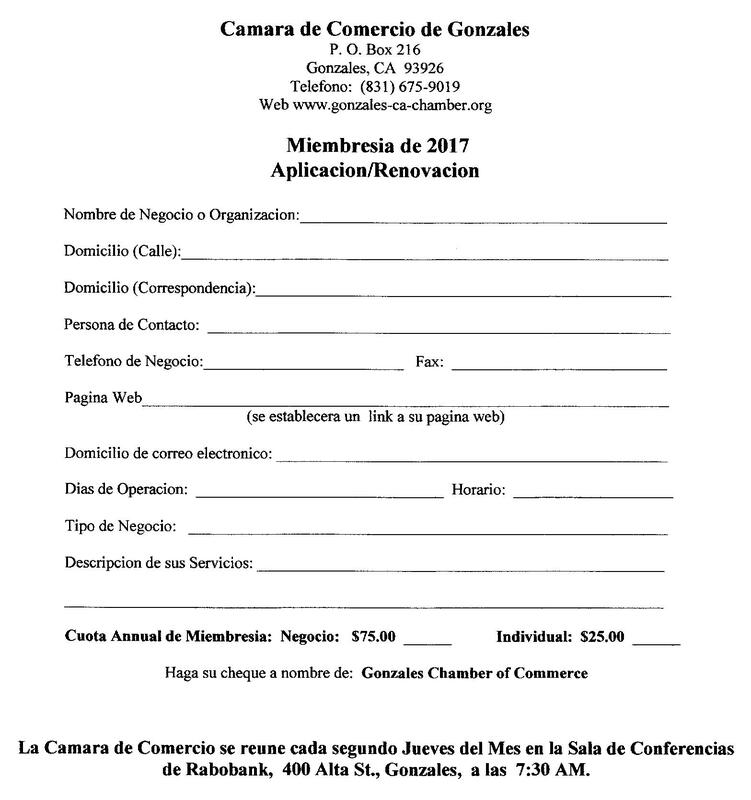 Welcome to the Gonzales Chamber of Commerce website. If you haven't been to the City of Gonzales recently, you will find that its downtown area has been revitalized and there has been surge of activity and economic growth. With growth of the community comes expansion of businesses. Many of our Chamber Members have lived and worked in Gonzales for many years and are proud of the improvements that have been done. 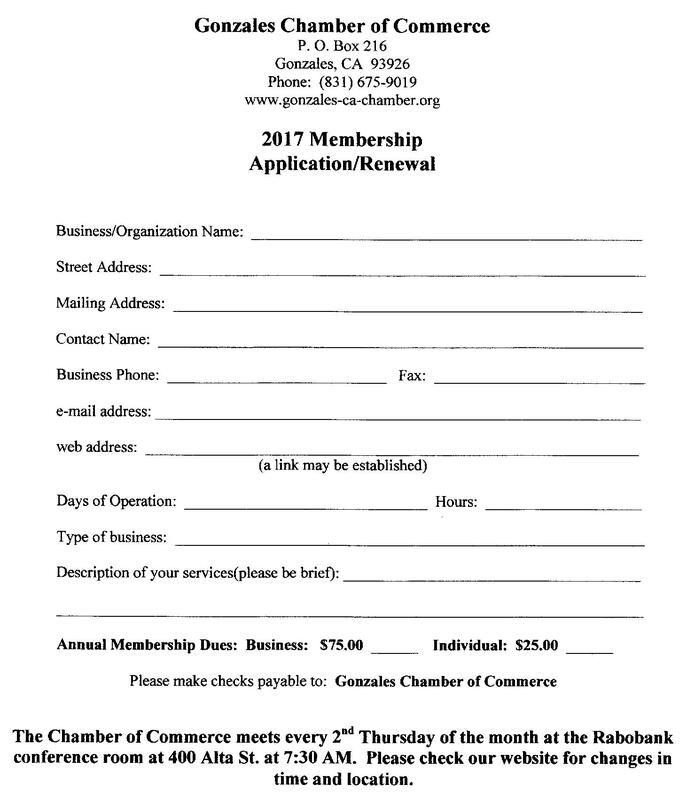 New businesses are being attracted to our community constantly and it is the chamber's mission to inform those who want to move or work in our community what services are available for them. 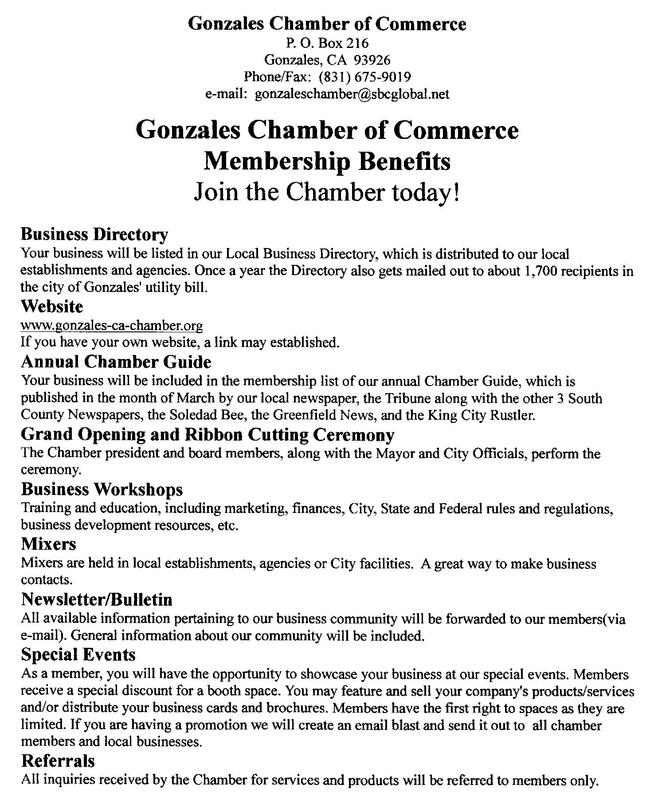 On this new Gonzales Chamber website we have not only listed all our members but, courtesy of the City of Gonzales, all those who do business with the city. The result is a resource of more than 250 businesses. Gonzales, the "Wine Capital of Monterey County", is located in the heart of the fertile, 90-mile long Salinas Valley. Situated between the scenic Santa Lucia and Gabilan Mountain ranges, the City is 30 miles southeast of the beautiful Monterey Peninsula and 18 miles south of Salinas. Gonzales is a growing community of over 8,500 residents, many of whom are young families that enjoy the friendly small-town ambiance, mild year-round weather and the safe community environment.